HTML (Hyper-Text Markup Language) is the markup language used for creating web pages . HTML elements form the building blocks of web pages. HTML5 is the fifth and latest revision of the HTML. HTML5 has additional elements (tags) added like , and making embedding of multimedia and graphical content into the web pages easier. HTML5 is the most popular mobile web development and mobile web app development platform being used today. It takes the user and developer experience of viewing and building web pages to the next level. 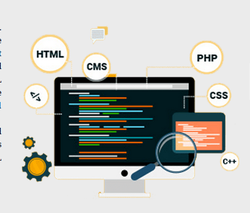 We are engaged in providing website development services such as HTML website. WebHostingRuchi provides professional web designer, web design and web designing services. We are located in Hyderabad, India and targeting all around the world in static website designing. We are based in Hyderabad, India and offers complete web design & Development service to our clients. HTML5 and CSS3 have just arrived (kinda), and with them a whole new battle for the ‘best markup’ trophy has begun. Truth to be told, all these technologies are mere tools waiting for a skilled developer to work on the right project. As developers we shouldn’t get into pointless discussions of which markup is the best. - WebHostingRuchi provides professional web designer, web design and web designing services. We are located in Hyderabad, India and targeting all around the world in static website designing. We are based in Hyderabad, India and offers complete web design & Development service to our clients.